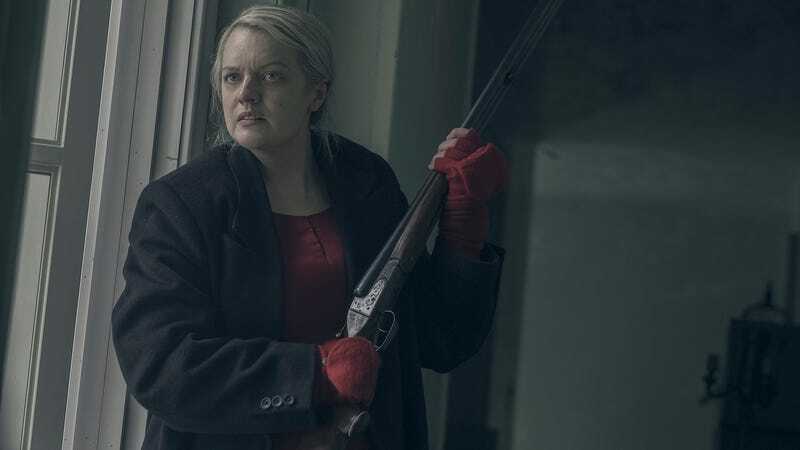 June (Elisabeth Moss) goes into battle mode in The Handmaid’s Tale season two. According to a Hulu press release, the currently-in-production third season will feature Meloni as Commander Winslow, “a powerful and magnetic Commander who hosts the Waterfords on an important trip,” while Reaser will play “Commander Winslow’s wife, who becomes a friend and inspiration to Serena Joy.” After tearfully handing “her” much-loved baby off to June, realizing the girl would have a much better life in free Canada rather than cruel and oppressive Gilead, Serena Joy probably needs all the friends she can get. Honestly that sounds like every other season of The Handmaid’s Tale, doesn’t it? All except for the mention of fighting, which bodes well for finally starting that full-on revolution that viewers have been dying to see since the show’s dystopian world revealed its misogynistic horrors in the series premiere. Hopefully Team Maids and Marthas will start taking the power back once The Handmaid’s Tale returns. Hulu has yet to reveal the premiere date but we’ll let you know when we find out.